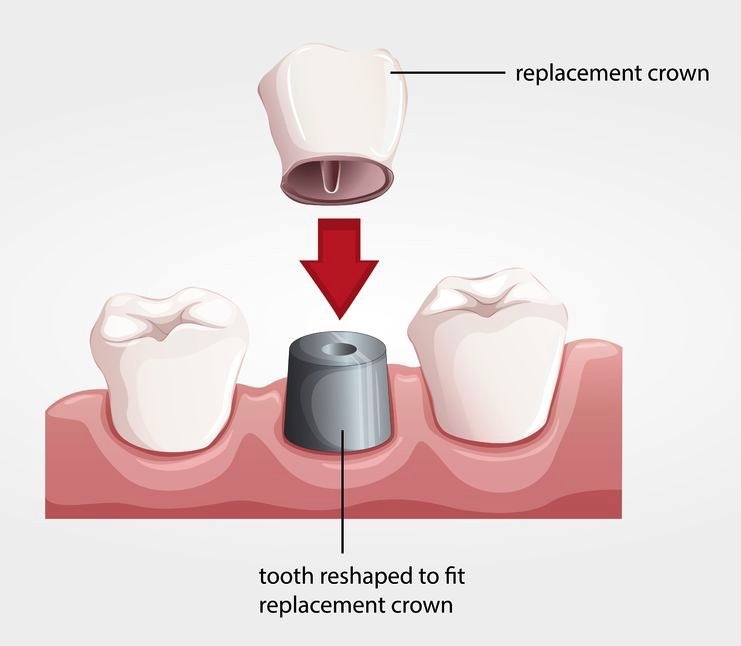 A crown, sometimes referred to as a cap, is a covering for your teeth that encases the whole surface, returning the tooth to its original size and shape. The crown strengthens the tooth structure your dentist cannot restore with fillings or other dental restorations. The most popular type of crown is porcelain, as it is the same colour as most teeth. Your dentist will make the porcelain crowns specifically to fit the size, shape, and colour of your teeth, in an effort to ensure you have a natural looking smile. These crowns are quite durable and will last years, however you may also need to replace them at some point because of regular wear, much like other dental restoration options. The process of getting a crown normally takes two appointments. During your first appointment, your dentist will take molds of the area, being as accurate as possible, which they will then use to create your crown. They can also use the mold to manufacture a temporary crown you can wear on your tooth until they create the permanent crown, which will be done in a dental laboratory. To apply the temporary crown, your dentist will numb the area and remove any tooth decay. They will also shape the surface of your tooth so the crown will fit properly. Your dentist will then place the crown and its temporary cement. Once these are applied, your dentist will check to ensure you are biting properly. Your second appointment will start with your dentist removing the temporary crown. Once they do this, they will clean your tooth again before placing the permanent custom crown. After they place the new crown, they will once again check your bite to ensure everything is correct. Before the appointment ends, your dentist will give you specific care instructions. You are also advised to have regular dental appointments to check your new crown.